The tangled garden of chenille decoration on this court mantua enhances the white silk satin fabric. 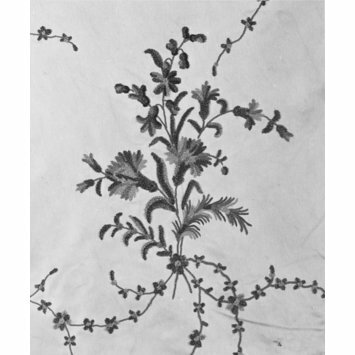 It is tamboured (chain stitched with a hook instead of a needle) with coloured silk and chenille threads, in a meandering pattern of flowers and leaves. 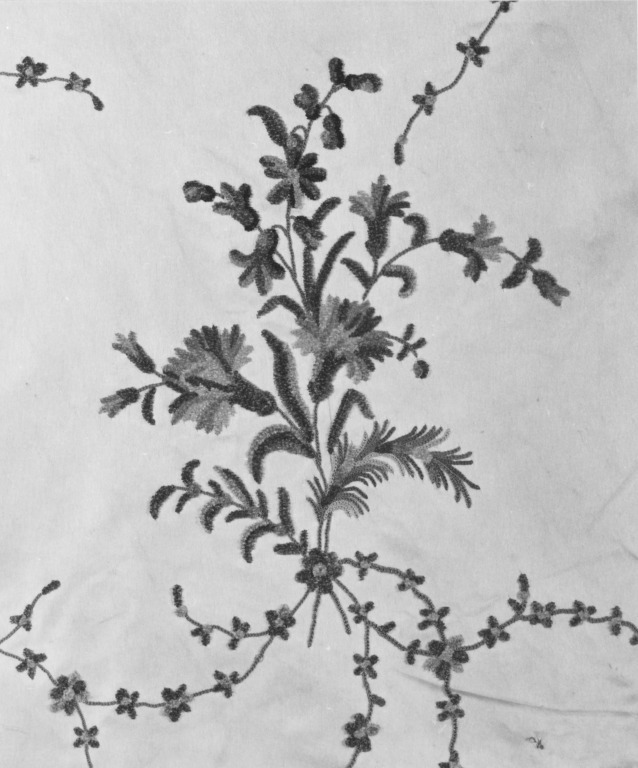 A fringe of chenille threads, wound into the shapes of more flowers and leaves, trims the mantua. Bobbin lace of silk and chenille edges the fringe and neckline. The quality of the needlework suggests French production. In style, the design reflects the woven silk patterns of the 1750s, designs that remained fashionable in embroidery until the 1790s. The mantua was probably made in the late 1770s and the bodice modified slightly in the 1780s. Its petticoat of matching fabric suffered extensive alterations for fancy dress in the late 19th century. A woman's court mantua of white silk satin tamboured in a pattern of floral sprigs with chenille silk thread. The mantua is open at the front with elbow-length sleeves with double scalloped sleeve ruffles. The bodice fronts meet in the centre.The mantua back is comprised of two widths of silk, pleated above the waist and extending into a long train below. The bodice and sleeves are lined with bleached linen; the lower part of the train is faced with white silk taffeta. The sleeves are weighted with lead discs. A broad ruffle of silk extends from the bottom of the bodice at centre front around the back at the waist. A wired fringe of chenille and floss silk in the form of flowers edges the train, the sleeve ruffles, the ruffle at the waist and the neckline. A narrow border of silk bobbin lace trims the train,the sleeve ruffles and the neckline. Pleat marks on the bodice front indicate that the mantua originally had robings and was probably worn iwth a stomacher. The robings were opened out and pieced so the bodice fronts met in the centre, probably in the early 1780s.